Both my daughter and I did some crafting this Christmas. An entirely handmade holiday would be too much work, but we always try to sprinkle in soft gifts with the inevitable techy ones. My nephew got Legos, but my niece got rainbow leg warmers (which looked so tiny while I was knitting them, but are obviously just right on her)! I found a great coffee cup sleeve pattern on Ravelry that is perfect for all those ends of yarn skeins and knit up a bunch to give to my knit night ladies. 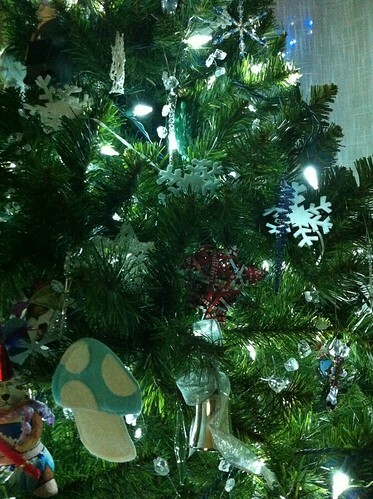 And finally, our tree got a little love. Years ago I made a red tree skirt with Swedish Dala horses which goes great with all our red and folky ornaments, but I’ve been wanting a more frosty looking skirt for the years we hang our icicle and snowflake ornaments. It’s been low priority though. This year I came into possession of four garbage bags of fabric from a woman who passed away. Included was a huge piece of grey wool. Perfect for embroidering a few snowflakes onto and making a tree skirt. When I cut the fabric though, I realized it was full of moth holes. So, I pulled white felt (leftover from Halloween Smurf hats for the taekwondo dojang a few years ago) from my stash, and the dregs of a skein of yarn leftover from the ripple afghan I made a few more years earlier, and voila, every circle covers at least one moth hole if not more. 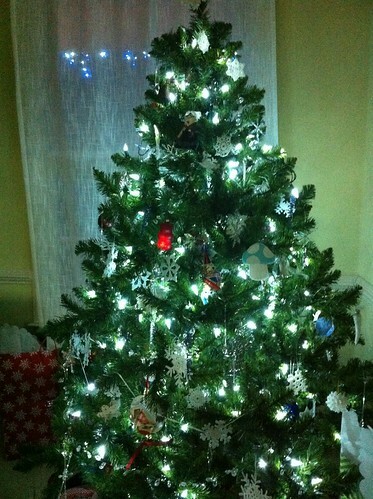 It’s simple stitching, but gets the job done and looks quite nice under the tree I think. May the spirit of generosity, the light of lengthening days, and the warmth of family fill your days. It’s been quiet here on ye olde blog. I’ve been knitting for Christmas. And to be perfectly honest, been knitting for fun just because it takes less brain power. I promise myself that I will get back to taking myself seriously as soon as the holiday festivities are over, but in the mean time, here’s the sea of wool I’ve been swimming in.